When in the world will I have time for a personal blog? Maybe never. But for those times when I want to blog something and it doesn’t fit the work blogs, Twitter, Facebook, Google+ or other social networks, then this is where that idea or thought will find itself. Below is where you can find a current bio, current as of Nov 1st, 2013. 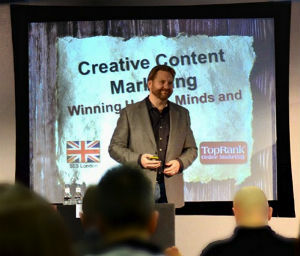 Lee Odden is a digital marketer, author and agency CEO focused on growing community and optimizing marketing performance through integrated search, social media and content marketing. For over 16 years he and TopRank Marketing have worked with major B2B and consumer brands to attract and engage communities to inspire community, sales and advocacy. Cited by the Wall Street Journal, The Economist and the New York Times for his digital marketing expertise, Lee has been consulting and writing about integrated online marketing for nearly 10 years at TopRankBlog.com. Lee is a popular public speaker on the topics of integrated digital marketing and PR and has given keynote presentations, conducted workshops and solo presentations all over the world from New York to London to Moscow to Hong Kong. Thanks for the suggestion Barbara. I’ll email. I met you 2 years ago at a Randstad Blue Chip Management Training session. You presented a “basics” class to the Blue Chippers. I am now on the Board for the So Cal Tech Serve Alliance and they are interested in seeing if you had a condensed version of the session I was in. I can be reached at dan.cordero@randstadusa.com or (949) 254-9522. I’m making a blog post with a list of the very best Content Marketing experts of 2016. You are one of the top experts on the list. If you want me to add or quote anything on your section, please let me know. And of course I’ll give a link back to you.